Kyle Elliot Korver (born March 17, 1981) is an American professional basketball player for the Utah Jazz of the National Basketball Association (NBA). He played college basketball for the Creighton Bluejays and was drafted in the second round of the 2003 NBA draft by the New Jersey Nets. He was immediately traded to the Philadelphia 76ers. After four and a half seasons in Philadelphia, he was traded to the Jazz. During his first stint with the Jazz, in 2009–10, Korver shot 53.6 percent from three-point range, which set an NBA single-season three-point field goal accuracy record. In 2010, he joined the Chicago Bulls. In 2012, he was traded to the Atlanta Hawks, where in 2015, he was named NBA All-Star. In 2017, he was traded to the Cleveland Cavaliers, where he was a member of back-to-back Finals teams. In 2018, he was traded back to the Jazz. Korver was born in Paramount, California, and is the oldest of four children of Kevin Korver, a pastor for the Third Reformed Church in Pella, Iowa, and Laine Korver. Both of his parents played basketball at Central College in Pella. His grandfather, Harold Korver, is also a pastor at the Immanuel Reformed Church in Paramount, California. He grew up in the Los Angeles area and was a Los Angeles Lakers fan as a child. Watching Magic Johnson, Kareem Abdul-Jabbar, and the Showtime Lakers instilled a love of basketball in Korver that made him want to pursue it himself. He moved to Iowa in 1993 when his father accepted his current pastoral position and graduated from Pella High School. In 2018, he and his three brothers were still in the top 10 in both career scoring and rebounding at Pella High. As a freshman at Creighton in 1999–2000, Korver was named to the MVC's All-Bench team, All-Freshman team and All-Newcomer team while averaging 8.8 points per game. He came off the bench in all but one game, hitting 43.4 percent of his three-pointers and 89.5 percent at the free-throw line. As a sophomore in 2000–01, Korver earned second-team All-MVC honors while leading the league champion Jays with 14.6 points per game and hitting a then-record 100 three-pointers while ranking 12th nationally with 45.2 percent accuracy from downtown. He was also named to the MVC All-Tournament team. As a junior in 2001–02, Korver led Creighton in scoring (15.1), rebounding (5.5), assists (3.3) and steals (1.6) while earning MVC Player of the Year and honorable-mention All-America honors. He ranked 12th nationally in free throw percentage (89.0) and 41st in three-point percentage (42.9) while leading the Jays to MVC regular-season and Tournament titles. As a senior in 2002–03, Korver became one of six players to repeat as MVC Player of the Year, joining Larry Bird, Hersey Hawkins, Xavier McDaniel, Lewis Lloyd and Junior Bridgeman. He was a consensus All-American, including second-team honors from the Associated Press, ESPN.com and the USBWA, and earned MVC Tournament MVP honors for the second year in a row. In 34 games as a senior, he averaged 17.8 points, 6.4 rebounds, 3.1 assists and 1.5 steals in 31.8 minutes per game. Korver finished his career at Creighton fourth all-time in scoring (1,801), first in three-pointers made (371), first in three-point attempts (819), first in three-point accuracy (45.3), first in free throw accuracy (89.1), eighth in assists (294), ninth in blocked shots (58) and fourth in steals (172). His 371 career made three-pointers is an MVC record and tied for sixth most in NCAA history. Korver also holds Creighton single-season records for three-pointers made (129), three-point percentage (.480), and free-throw percentage (.908). Korver graduated with a bachelor's degree in visual communications. On June 26, 2003, Korver was selected by the New Jersey Nets with the 51st overall pick in the 2003 NBA draft. The Nets, fresh off an Atlantic Division win and an appearance in the NBA Finals, were low on cash and had none of their preferred draft choices remaining on the board. The organization selected Korver and immediately sold his draft rights to the 76ers for $125,000. The $125,000 reportedly covered the Nets' summer league costs and covered buying a new copy machine. As a rookie in 2003–04, he averaged 4.5 points and 1.5 rebounds in 74 games. On December 21, 2003, he scored a season-high 18 points against the Boston Celtics. In 2004–05, Korver appeared in 82 games (57 starts), and averaged 11.5 points, 4.6 rebounds and 2.2 assists. He set the Sixers record for three-pointers made (226) and attempted (558). He led the league in three-pointers made, and ranked among NBA leaders in attempts (third) and percentage (18th, .405). On November 26, 2004, he scored a season-high 26 points against the Washington Wizards. On August 2, 2005, Korver re-signed with the 76ers to a six-year, $25 million contract. On February 24, 2006, he scored a career-high 31 points in a 116–111 win over the Milwaukee Bucks. In 82 games (43 starts) in 2005–06, he averaged 11.5 points, 3.3 rebounds and 2.0 assists in 31.3 minutes. He shot .430 from the field and .849 from the free-throw line and ranked fifth in the league in three-pointers made and 11th in three-point percentage. In his last full year in Philadelphia in 2006–07, Korver appeared in 74 games (one start), and averaged a career-high 14.4 points. He led the NBA in free throw percentage and ranked ninth in three-point shooting. On February 21, 2007, he made six 3-pointers and matched a career high with 31 points to lead the 76ers to a 104–84 victory over the New York Knicks. On December 29, 2007, Korver was traded to the Utah Jazz in exchange for Gordan Giriček and a future first-round draft pick. On February 6, 2008, he scored a season-high 27 points against the Denver Nuggets. In 2008–09, Korver appeared in 78 games (two starts) and averaged 9.0 points, 3.3 rebounds and 1.8 assists. On March 14, 2009, he scored a season-high 25 points against the Miami Heat. On October 28, 2009, Korver underwent surgery to remove a bone spur in his left knee. He subsequently missed the first 23 games of the 2009–10 season. On March 31, 2010, he scored a season-high 21 points against the Golden State Warriors. In 52 games, he averaged 7.2 points and 2.1 rebounds. He led the NBA in three-point shooting at .536 (59-110 3FGM), setting the NBA single season three-point shooting record, edging the record percentage of .524 that Steve Kerr set in 1994–95. His spot-on shooting surged after he finally returned fully healthy after the All-Star break, having struggled with wrist and knee issues following surgeries to both over the previous year. Korver warms up before a 2011 playoff game. On July 13, 2010, Korver signed with the Chicago Bulls. On November 24, 2010, he scored a season-high 24 points against the Phoenix Suns. In 2010–11, Korver, for the third time in his career, appeared in all 82 regular-season games (all coming off the bench), and averaged 8.3 points, 1.8 rebounds and 1.5 assists in 20.1 minutes. After finishing as the first seed in the East with a 62–20 record, the Bulls advanced through to the Eastern Conference finals, where they were defeated in five games by the Miami Heat. 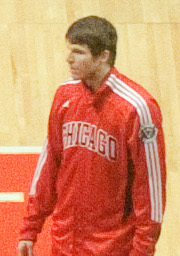 Korver appeared in 65 games (seven starts) with the Bulls in 2011–12, averaging 8.1 points, 2.4 rebounds and 1.7 assists in 22.6 minutes. On March 10, 2012, he scored a season-high 26 points in a 111–97 win over the Utah Jazz. He hit 6 of 11 3-pointers and had seven rebounds and six assists. On July 16, 2012, Korver was traded to the Atlanta Hawks in exchange for cash considerations. In 2012–13, he averaged 10.9 points in 30.5 minutes per game, while recording percentages of .461 FG%, .457 3FG%, and .859 FT%. He finished second in the NBA in three-point percentage and fourth in three-point field goals made with 189. He made at least one three-pointer in his final 73 games of the season, the longest active streak in the NBA at the time, a career-best and the fourth longest streak in league history (Dana Barros 89, Michael Adams 79, Dennis Scott 78). In addition, his 189 made threes was the fourth-best single season total in franchise history. On July 12, 2013, Korver re-signed with the Hawks to a four-year, $24 million contract. 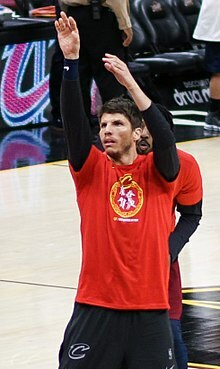 On December 6, 2013, Korver passed the NBA record for most consecutive games with a made three-pointer (90) originally set by Dana Barros (89). The streak eventually ended at 127 games on March 5, 2014. Korver finished the 2013–14 season with a 47.2 percent three-point shooting percentage which led the NBA. On December 15, 2014, Korver passed Jason Richardson for 15th all-time in three-pointers made. Five days later, in the Hawks' 104–97 win over the Houston Rockets, Korver scored a game-high 22 points and made all four of his free-throw attempts. This gave him 49 consecutive made free-throws on the season to set a new Hawks franchise record. The streak ended at 50 in the Hawks' next game against the Dallas Mavericks. On February 10, 2015, Korver received his first NBA All-Star selection as a reserve for the Eastern Conference in the 2015 NBA All-Star Game, replacing the injured Dwyane Wade. At 33 years and 11 months old, he became the fourth-oldest first-time All-Star. On March 11, in a loss to the Denver Nuggets, Korver passed Kobe Bryant for 12th on the all-time three-pointers made list. Four days later, in a win over the Los Angeles Lakers, Korver left the game with a broken nose after taking an offensive foul from Ed Davis with 8:59 left in the first half. The injury ended a streak of 51 consecutive games with a three-pointer by Korver, who missed both of his shots from behind the arc. After missing three games with the injury, he returned to action on March 22 against the San Antonio Spurs with protective gear on his face to cover the nose. Despite having the mask, on March 31, 2015 against the Milwaukee Bucks, Korver made four straight long-range shots, including three 3-pointers, in a 65-second span. On April 29, 2015, Korver was named the recipient of the Joe Dumars Trophy for winning the 2014–15 NBA Sportsmanship Award. During the 2015 playoffs, Korver suffered a right ankle sprain playing against the Cleveland Cavaliers on May 22 in the Eastern Conference Finals. The following day, he was ruled out for the rest of the playoffs. On November 6, 2015, Korver scored 22 points, hitting all eight of his shots, including four from three-point range, as the Hawks won their sixth straight with a 121–115 victory over the New Orleans Pelicans. On December 26, in a win over the New York Knicks, Korver hit one three-pointer and passed Rashard Lewis for ninth place on the all-time list for three-pointers made. However, his late December shooting slump marked one of the worst shooting stretches of his career. In four games between December 23–29, Korver shot 5-of-33 from the field and a woeful 2-of-27 from three-point range. Korver continued to struggle with his shot in January, missing all six of his shots on January 31 against the Miami Heat, marking just the third time in his career that he went 0-of-6 or worse as a starter. Over 47 games to begin the season, his 42% field goal shooting was the worst it had been since the 2004–05 season, and his 37% three-point shooting was a career-low success rate. On December 16, 2016, Korver scored a season-high 19 points and hit a season-high six three-pointers in a 125–121 win over the Toronto Raptors. The win gave the Hawks a 13–13 record after 26 games; they began the season 9–2. He set a new season high on December 30, scoring 22 points in 29 minutes off the bench in a 105–98 win over the Detroit Pistons. On January 7, 2017, Korver was traded to the Cleveland Cavaliers in exchange for Mike Dunleavy, Mo Williams, cash considerations and a protected future first round draft pick. He made his debut for the Cavaliers three days later, recording two points and three rebounds in 17 minutes off the bench in a 100–92 loss to the Utah Jazz. Korver went 2-of-10 over his first two games for the Cavaliers, with both games resulting in losses. On January 13, he scored 18 points off the bench to help the Cavaliers defeat the Sacramento Kings 120–108. On February 1, he had his best game as a Cavalier, scoring 20 points off the bench on 8-of-11 from the field with four three-pointers in a 125–97 win over the Minnesota Timberwolves. On February 8, Korver scored a season-high 29 points on 10-of-12 from the field and 8-of-9 from the three-point line in a 132–117 win over the Indiana Pacers. He subsequently passed Jason Kidd (1,988) for seventh on the all-time three-pointers made list. A week later, on February 15, also against the Pacers, Korver became the seventh player in NBA history to make 2,000 career three-pointers, joining Ray Allen, Reggie Miller, Jason Terry, Paul Pierce, Vince Carter, and Jamal Crawford. On April 4, 2017, he returned after missing 11 games with a sore left foot and scored 11 points in 12 minutes in a 122–102 win over the Orlando Magic. Korver helped the Cavaliers go 12–1 over the first three rounds of the playoffs to reach the 2017 NBA Finals. There they faced the Golden State Warriors and were defeated in five games. On July 12, 2017, Korver re-signed with the Cavaliers. On November 13, 2017, he scored 19 of his 21 points in the fourth quarter to spark a huge comeback for the Cavaliers, lifting them to a 104–101 win over the New York Knicks after they outscored New York 43–25 in the fourth. On January 6, 2018, in a 131–127 win over the Orlando Magic, Korver tied Paul Pierce for fourth place on the career 3-pointers list with 2,143. Two days later, he hit four 3-pointers and had 19 points off the bench in a 127–99 loss to the Minnesota Timberwolves, passing Pierce for fourth place on the NBA's all-time list in 3-pointers made with 2,147. On February 9, 2018, he scored a season-high 30 points in a 123–107 win over the Atlanta Hawks. He made 7 of 13 from 3-point range and finished two points from matching his career high of 32. It was his first 30-point game since February 21, 2007. Korver went 794 games between 30-point games, marking the longest stretch between 30-point games in NBA history. The Cavaliers returned to the NBA Finals in 2018, where they lost 4–0 to the Warriors. On October 30, 2018, in a 136–114 win over the Atlanta Hawks, Korver reached 11,000 career points. On November 29, 2018, Korver was traded to the Utah Jazz in exchange for Alec Burks and two future second-round draft picks. On January 12, 2019, against the Chicago Bulls, Korver passed Jason Terry (2,282) to move into fourth place on the NBA's all-time 3-pointers list. Korver has three brothers, Klayton, Kaleb and Kirk (1990–2018), all of whom have played Division I basketball. Klayton was a guard/forward for the Drake Bulldogs; Kaleb was a guard for the Creighton Bluejays; and Kirk played forward for the UMKC Kangaroos. His mother Laine played high-school basketball and once scored 74 points in a game. Korver's father, Kevin, is a pastor in Pella, Iowa. Korver's uncle, Kris Korver, is the head basketball coach at Northwestern College in Orange City, Iowa. His cousin Kari Korver is a former UCLA women's basketball player. Korver married Juliet Richardson on August 10, 2011. Their daughter, Kyra Elyse, was born on December 5, 2012. His wife delivered their first boy, Knox Elliot, on October 4, 2014. Their second son, Koen, was born on November 7, 2016. Korver has his own charitable foundation, called the "Kyle Korver Foundation", which contributes to many philanthropic causes. He held a coat drive while with the 76ers, where he collected and donated coats to children in need. Korver added a new line of clothing called "Seer Outfitters" that is connected with his foundation KKF to help the underprivileged children. In 2013, he started an annual sock drive in October called the "Socktober Drive" in which he collects socks to donate to homeless people in Atlanta. Korver has also participated in the NBA's Basketball Without Borders outreach program in Africa, China, Brazil, and India. In March 2018, Korver took a leave of absence from the Cavaliers following the death of his brother Kirk. ^ a b c d e f g h "Prospect Profile: Kyle Korver". NBA.com. Retrieved March 6, 2014. ^ a b Harris, Gerald (April 15, 2015). "KYLE KORVER: TRUST GOD'S PLAN". Christian Index. ^ a b c Windhorst, Brian (May 23, 2018). "Korver succeeds in season of sorrow". ESPN.com. Retrieved May 23, 2018. ^ a b c Vivlamore, Chris (February 14, 2013). "Kyle Korver: The making of a sharp-shooter". AJC.com. Atlanta Journal Constitution. Retrieved April 29, 2014. ^ a b c d e f "#25 Kyle Korver". GoCreighton.com. Retrieved August 26, 2014. ^ "Kyle Korver College Stats". Sports-Reference.com. Retrieved November 30, 2018. ^ Lowe, Zach (July 29, 2014). "Kyle Korver: An Offense Unto Himself". grantland.com. Retrieved November 30, 2018. ^ "Kyle Korver 2003-04 Game Log". Basketball-Reference.com. Retrieved November 30, 2018. ^ "Kyle Korver 2004-05 Game Log". Basketball-Reference.com. Retrieved November 30, 2018. ^ "Transactions: 2005-06 Season". NBA.com. Retrieved November 30, 2018. ^ Ford, Chad (July 24, 2005). "Agent says Sixers to sign Dalembert to six-year deal". ESPN.com. Retrieved July 29, 2014. They also reached six-year deals with Kyle Korver for $25 million and with Willie Green for about $20 million. ^ "Korver's 31 Points Lifts 76ers Over Bucks". NBA.com. February 24, 2006. Retrieved July 29, 2014. ^ Gelston, Dan (February 21, 2007). "Korver Lights Up to Propel Sixers Past Knicks". NBA.com. Retrieved April 9, 2007. ^ "Sixers Trade Korver to Jazz for Giricek, Future First-Rounder". NBA.com. December 29, 2007. Retrieved November 30, 2018. ^ Shalin, Mike (December 30, 2007). "Sixers send Korver to Utah in Giricek swap". Reuters.com. Retrieved December 30, 2007. ^ "Kyle Korver 2007-08 Game Log". Basketball-Reference.com. Retrieved November 30, 2018. ^ "Kyle Korver 2008-09 Game Log". Basketball-Reference.com. Retrieved November 30, 2018. ^ "Utah's Korver has successful knee surgery". NBA.com. October 28, 2009. Retrieved November 30, 2018. ^ "Flynn's layup gives Wolves fourth win when Williams' 3 off mark". ESPN.com. December 14, 2009. Retrieved November 30, 2018. Jazz F/G Kyle Korver made his season debut after missing the first 23 games because of knee surgery. ^ "Kyle Korver 2009-10 Game Log". Basketball-Reference.com. Retrieved November 30, 2018. ^ a b Genessy, Jody (April 15, 2010). "Utah Jazz: Kyle Korver sets NBA record for 3-point accuracy". DeseretNews.com. Retrieved April 15, 2010. ^ "Kyle Korver 2010-11 Game Log". Basketball-Reference.com. Retrieved November 30, 2018. ^ "Short-handed Bulls bounce back against Jazz". ESPN.com. March 10, 2012. Retrieved March 10, 2012. ^ "HAWKS ACQUIRE KYLE KORVER FROM THE BULLS". NBA.com. July 16, 2012. Retrieved July 16, 2012. ^ "ATLANTA HAWKS SIGN KYLE KORVER TO NEW CONTRACT". NBA.com. July 12, 2013. Retrieved July 12, 2013. ^ Stein, Marc (July 3, 2013). "Sources: Hawks, Kyle Korver agree". ESPN.com. Retrieved November 30, 2018. ^ Winkeljohn, Matt (December 6, 2013). "Notebook: Hawks 108, Cavaliers 89". NBA.com. Retrieved December 6, 2013. ^ "Korver sets 3-point mark, Hawks beat Cavs 108-89". ESPN.com. December 6, 2013. Retrieved December 9, 2013. ^ Freeman, Joe (March 5, 2014). "Trail Blazers 102, Atlanta Hawks 78: Beyond the box score". OregonLive.com. The Oregonian. Retrieved March 5, 2014. ^ Newberry, Paul (December 16, 2014). "Horford scores 21, leads Hawks past Bulls 93-86". NBA.com. Retrieved December 16, 2014. ^ Rieken, Kristie (December 20, 2014). "Korver leads Hawks over Houston 104-97". NBA.com. Retrieved December 20, 2014. ^ "Hawks' Korver to replace Heat's Wade in All-Star Game". NBA.com. February 10, 2015. Retrieved February 10, 2015. ^ "Danilo Gallinari's 23 key Nuggets to 8th straight home win over Hawks". ESPN.com. March 12, 2015. Retrieved March 12, 2015. ^ Resnick, Joe (March 16, 2015). "Hawks hold off Lakers 91-86". NBA.com. Retrieved March 16, 2015. ^ "Kyle Korver back wearing facial gear". ESPN.com. March 22, 2015. Retrieved March 22, 2015. ^ "Kyle Korver scores 11 points in 65 seconds as Hawks bring down Bucks". sports.yahoo.com. March 31, 2015. Retrieved March 3, 2018. ^ "Kyle Korver Wins 2014-15 NBA Sportsmanship Award". NBA.com. April 29, 2015. Retrieved April 29, 2015. ^ Arnovitz, Kevin (May 23, 2015). "Kyle Korver to miss rest of postseason". ESPN.com. Retrieved May 23, 2015. ^ Martel, Brett (November 6, 2015). "Korver helps Hawks win 6th straight, 121-115 over Pelicans". NBA.com. Retrieved November 6, 2015. ^ Henry, George (December 26, 2015). "Millsap, Horford lead Hawks in big surge past Knicks". NBA.com. Retrieved December 26, 2015. ^ Godwin, Jordan (December 29, 2015). "Horford leads Hawks to 121-115 win over the Rockets". NBA.com. Retrieved December 29, 2015. ^ Reynolds, Tim (January 31, 2016). "Heat win season-best 4th straight, top Hawks 105-87". NBA.com. Retrieved January 31, 2016. ^ "Howard scores 27 as Hawks end Raptors' 4-game win streak". ESPN.com. December 16, 2016. Retrieved December 17, 2016. ^ "Korver, Howard lead Hawks past Pistons, 105-98". ESPN.com. December 30, 2016. Retrieved December 31, 2016. ^ "OFFICIAL: Cavaliers Acquire Kyle Korver From Hawks". NBA.com. January 7, 2017. Retrieved January 7, 2017. ^ "Hayward helps Jazz hold off LeBron, beat Cavs 100-92". ESPN.com. January 10, 2017. Retrieved January 10, 2017. ^ "Irving, Korver lead Cavaliers past Kings 120-108". ESPN.com. January 13, 2017. Retrieved January 14, 2017. ^ "James, Irving pace Cavaliers in 125-97 win over Timberwolves". ESPN.com. February 1, 2017. Retrieved February 2, 2017. ^ "Korver's 3s, James' energy boost lead Cavs past Pacers". ESPN.com. February 8, 2017. Retrieved February 8, 2017. ^ "LeBron scores 31, Irving 26 as Cavs beat Pacers 113-104". ESPN.com. February 15, 2017. Retrieved February 15, 2017. ^ "LeBron, Love lift Cavaliers past Magic, 122-102". ESPN.com. April 4, 2017. Retrieved April 5, 2017. ^ "Cavaliers Re-Sign Guard Kyle Korver". NBA.com. July 12, 2017. Retrieved July 12, 2017. ^ "James, Korver lead Cavs' charge in 4th to top Knicks 104-101". ESPN.com. November 13, 2017. Retrieved November 13, 2017. ^ "Wiggins, Butler lead 127-99 Wolves romp past James, Cavs". ESPN.com. January 8, 2018. Retrieved January 8, 2018. ^ "Korver has 30, James posts triple-double as Cavs top Hawks". ESPN.com. February 9, 2018. Retrieved February 9, 2018. ^ ESPNStatsInfo (February 9, 2018). "Kyle Korver had his first 30-point game since..." Twitter. Retrieved February 10, 2018. ^ "Cavaliers end season-opening slide, beat Hawks 136-114". ESPN.com. October 30, 2018. Retrieved October 30, 2018. ^ "Utah Jazz acquire guard/forward Kyle Korver". NBA.com. November 29, 2018. Retrieved November 29, 2018. ^ "Mitchell's 34 points push Jazz past Bulls, 110-102". ESPN.com. January 12, 2019. Retrieved January 13, 2019. ^ "NBA Player Free-Throw Shooting Statistics - 2006-07". ESPN.com. Retrieved December 31, 2016. ^ "NBA Player 3-Point Shooting Statistics - 2004-05". ESPN.com. Retrieved December 31, 2016. ^ "NBA Individual Regular Season Records for 3-Point Field Goal Percentage". basketball-reference.com. Retrieved February 3, 2018. ^ "UCLA's Kari Korver To Miss Basketball Season". CBSLocal.com. September 26, 2013. Retrieved September 26, 2013. ^ "Hawks' Kyle Korver Welcomes Baby Girl". AtlantaDailyWorld.com. Atlanta Daily World. December 7, 2012. Retrieved December 7, 2012. ^ "Kyle Korver Welcomes Birth of Baby Boy". Soaring Down South. October 8, 2014. Retrieved June 5, 2017. ^ Rowland, Brad (November 7, 2016). "Kyle Korver to miss Cleveland game after birth of child". Peachtree Hoops. Retrieved June 5, 2017. ^ Lucier, Maddy. "Kyle Korver's Clothing Line Benefits Underprivileged Children and Families". STACK. Retrieved June 5, 2017. ^ "76ers Drive For Kids". NBA.com. Retrieved January 6, 2017. ^ "The very good reason why athletes are drawing red Xs on their hands". For The Win. February 27, 2014. Retrieved June 5, 2017. ^ "Why Kyle Korver had red X on his hand during Cavaliers game Thursday night". cleveland.com. Retrieved June 5, 2017. ^ "NBA's Kyle Korver takes leave after death of brother, 27". Fox News. March 21, 2018. Retrieved March 21, 2018. 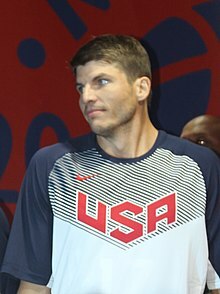 Wikimedia Commons has media related to Kyle Korver.